We continue selling-off after Tuesday’s “breakout”. It seems fairly safe to call Tuesday’s strength nothing more than a short-squeeze. Imagine the pain all the bears who were shaken-out as we broke above the consolidation or the bulls who bought the “breakout” are feeling today as the market reversed course. If there is one overriding truth we can count on is the market’s propensity toward humiliating as many people as it can at any one time. And more often than not, it crushes and humbles both bears and bulls before finally revealing its hand. 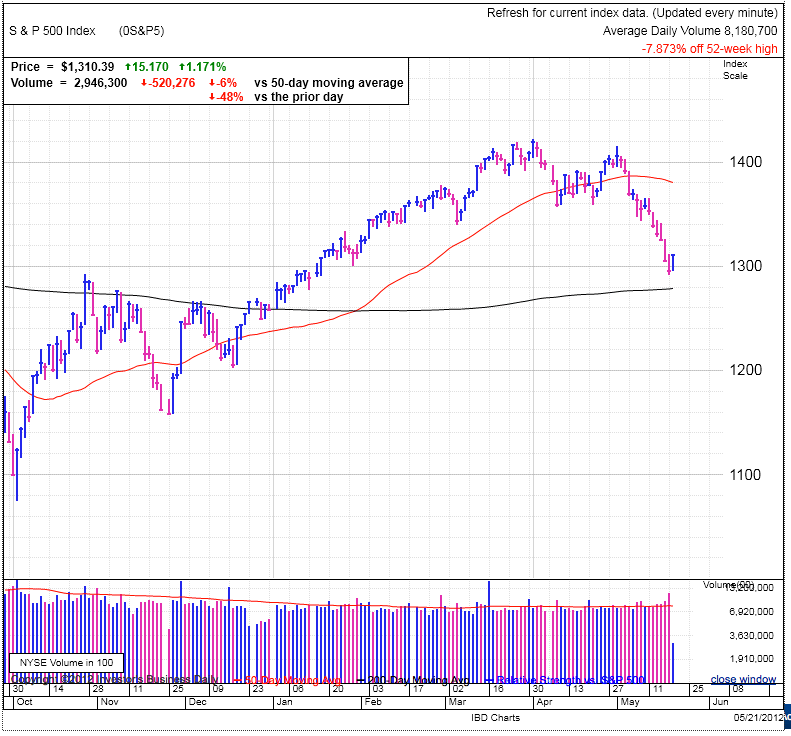 The market testing 1300 as we push toward the lower end of the recent consolidation. Will we bounce off of the recent lows? Will we plummet in a cascade of selling? For those in cash it really doesn’t matter. In fact, the lower the better because irrational selling creates more upside potential. But for those trying to play the short side, it helps to have profit targets. Tomorrow we’ll get the monthly employment report. Expectations have been dramatically lowered after the last couple misses and the deceleration in hiring we’ve seen in recent results. Will this trend continue, or will the lowered bar make it easier to surprise to the upside? While employment numbers were a big driver in 2009 and 2010, they have become less of a market moving data point recently. No doubt it will make waves, but as long as the number isn’t too shocking in either direction, the effect will be short-lived as the market quickly returns to its obsession over Greece and the Euro zone. But one thing to consider is we are still holding above the lows of the recent consolidation, meaning the current rally attempt is still alive and a strong employment number could trigger a follow through day tomorrow if we have a 1.4% pop on strong volume. While there are a lot of IBD50 stocks holding up during this correction, the thing to note is the difference in names between this week’s IBD50 and those form March. Many of the favorite stocks of the Q1 rally have completely fallen off the list. Often the higher they rise, the harder they fall. Most of IBD’s top groups are defensive, coming from the medical and banking industries. Are these stocks showing potential as the next big thing, or are they simply hiding places for long-only mutual funds trying to lose the least amount of money in a market correction? Stocks opened lower, giving back all of yesterday’s gains and then some. 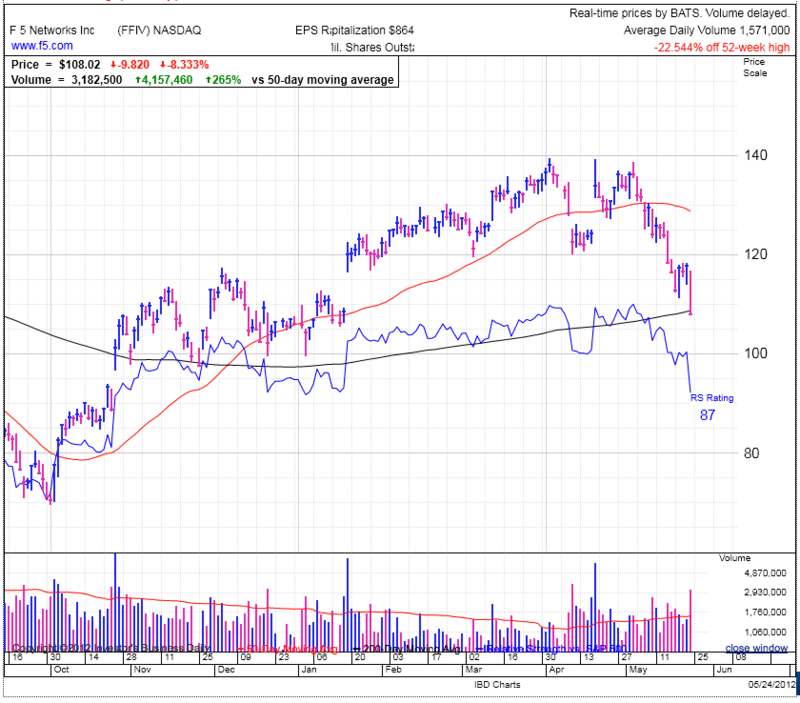 Good news one day, bad news the next, typical action for a consolidation. The interesting thing to watch is if this consolidation is the bottom of the range, or if it is a pause halfway down as part of a three wave correction. As I shared earlier, I expect at the very least we’ll retest the lows of the range and more likely than not make new lows before this is all said and done. The question is if the lows will be 1290, 1280, 1257, or lower. For the time being the market is reading too much into each headline coming out of Europe or China. One day the market is excited and the next it is dejected. No doubt the news will go both ways for a while and as a result the market will get whipped around. One thing to put all of this in perspective is no matter what the economy is doing, there will always be both good and bad headlines at any given time. What really matters is how the market responds given what the masses are inclined to gravitate toward. 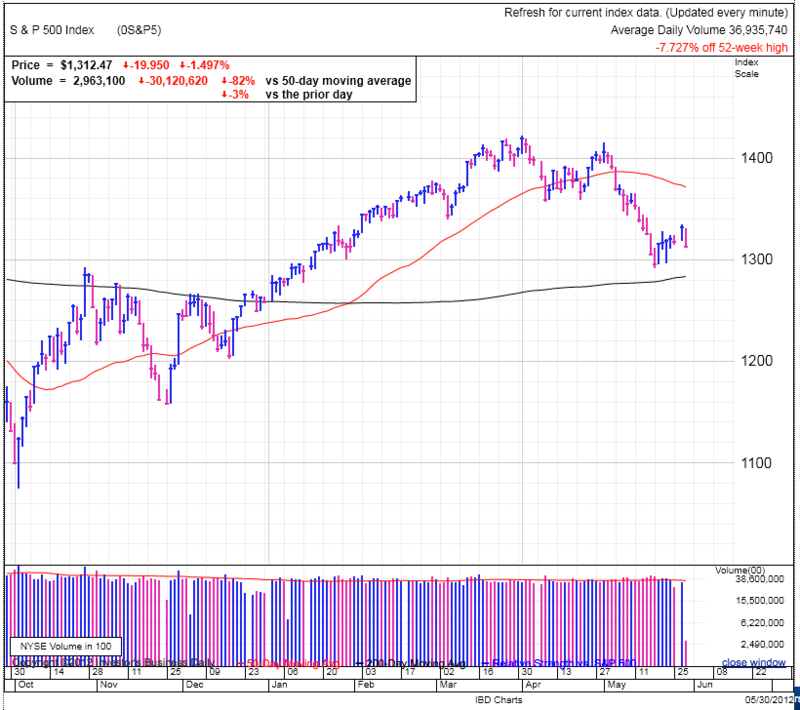 Is the market optimistic, pessimistic, or confused? Right now we are in a choppy consolidation because the market is swing back and forth between bullish and bearish biases. While it seems like the market is chaining its mind on a daily basis, what is really going on is neither the bulls nor bears have the strength to sustain a breakout and after a flurry of bull or bear activity, it quickly fizzles and the market swings back the other direction. Breaking the upper side of the recent consolidation shook out many bears and tempted premature breakout traders to go long. But this was nothing more than highly speculative buying and there is no substance to these traders as they come and go with the prevailing wind. To sustain a move higher we’re going to need buyers with conviction that are willing to hold for extended periods of time. With all the headline risk facing the markets, many of these longer-term traders are waiting out the uncertainty before committing more capital to the markets. Many of these savvy traders have the view they would rather buy several percent higher and forgo those profits if it means they have less risk of the market reversing on them. And this is why each breakout fails to gather the critical mass it needs to continue higher. 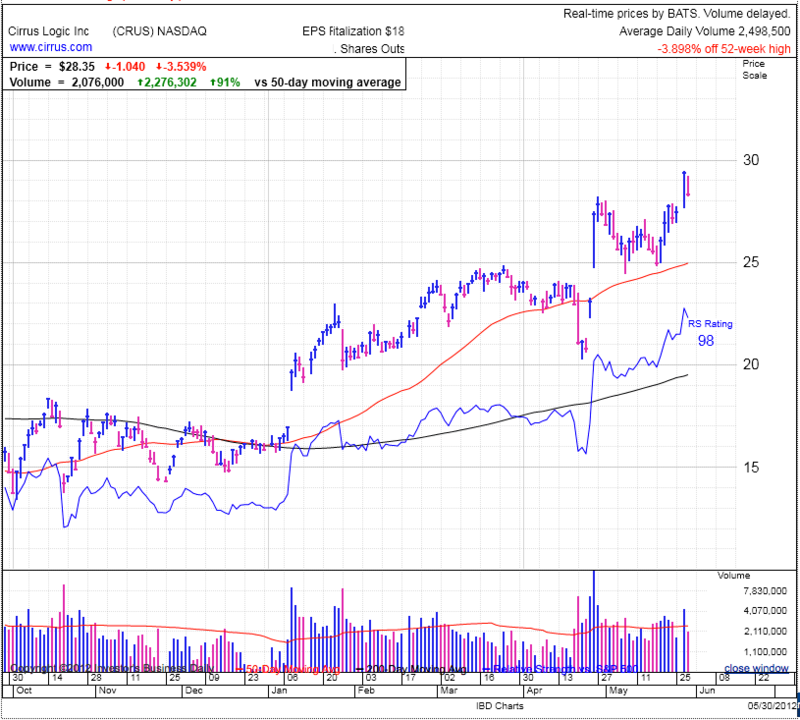 CRUS is trimming yesterday’s strong breakout gains. This demonstrates the risks associated with buying even the strongest stocks during a correction where very few stocks can overpower a declining market. And even the best performing stocks only notch modest gains during a correction, giving a very low risk to reward. As pointed out during our monthly IBD meetup, if WON makes all his portfolio managers hold cash during a correction, what makes us think we can do better? The goal isn’t to make all the money, but to capture a chunk of highest-probability profits when the wind is at our backs. Using leverage on the way up and sidestepping the pullbacks will produce great results even when buying late and selling early. 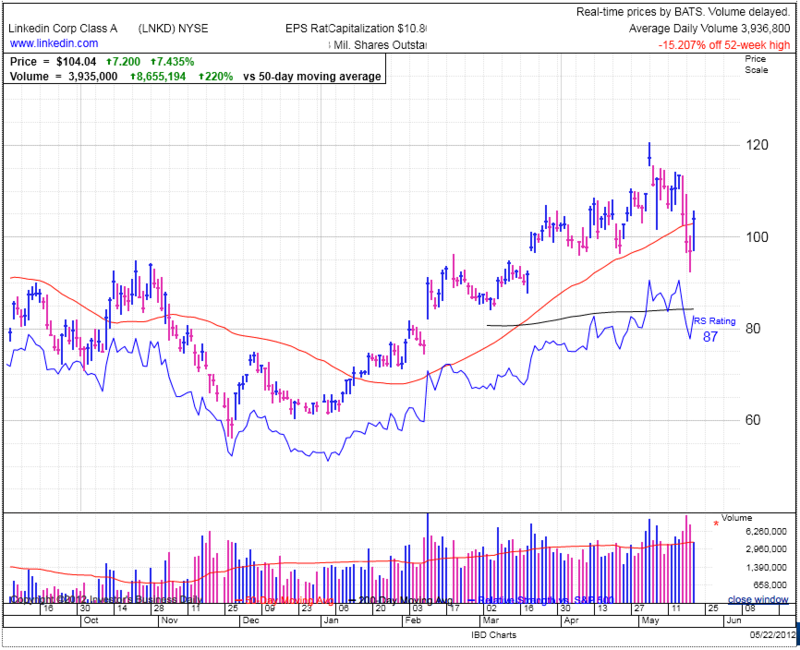 And back to CRUS, yesterday’s breakout is highly noteworthy and the stock should be added to a ready list for consideration when the uptrend resumes. It’s a quiet pre-holiday trading session. The market has been trading around breakeven all morning as everyone is far more focused on what they are going to do over the three-day weekend than what is happening in Europe. The thing we need to realize about Greece is by itself, a default or eviction from the Euro will have little direct effect on the banking system since all Greek debt is already viewed and booked as near worthless. No doubt it will hit some speculators and hedge funds making big bets on the outcome in the pocketbook, but we should not fear global contagion and banks falling like dominoes. Most major banks have either gotten rid of their Greek debt, hedged it, or written it down and already booked the loss. Greece losing the Euro will be a major disaster for the local region, but it will not be a material issue for the global financial sector. The fear in the markets has never been about what happens if Greece fails, but about the bigger dominoes like Spain and Italy, situations not already priced in the market. No doubt Germany could make an example out of Greece to get Portugal, Ireland, Italy, and Spain to tote the line, but ultimately I expect the Euro to hold together through a combination of all the ideas being thrown out there, namely a hybrid of bailouts, Euro bonds, money printing, and austerity. There are major negative consequences to each of these, but doing all in moderation will lead to the least bad resolution. Who wants to buy FB? Anyone? Anyone? Being a contrarian, seeing the humiliation suffered by early FB investors makes for an interesting counter-trend opportunity. No doubt the stock could decline a lot more from here and there is a very real risk of decelerated growth crushing its high-flying valuation, but all the highly bearish sentiment forming around this story makes me far more intrigued by this name. I continue to be skeptical of its long-term prospects because consumer tech companies have a limited shelf-life (just ask PALM, RIMM, AOL, MySpace, etc), but this highly skewed sentiment in FB could setup for some short-term trades. Regardless of which way FB eventually goes, no doubt there will be some tradable swings like we’ve seen in LNKD and GRPN. Obviously this is the deep-end of the pool, so only try something like this if you know what you are doing and understand the risks. The key to managing these kind of trades is capturing profits early and not allowing yourself to hold too long and get whipped around by the inevitable volatility. Did you see the olds? The markets bounced around modestly all morning and are currently lower with no new headlines to push the markets decisively one way or the other. For the time being the correction found footing around 1300 as the selling pressure moderated and value buyers are finding these levels attractive. Today is the first day that could qualify as a follow through day from Monday’s rally attempt. The thing to be careful of is while there are such things as V-bottoms, they are typically associated with frantic sell-offs that are emotionally charged and lack fundamental merit, thus the extreme plunge followed by a quick rebound. Further these are most often found in individual stocks, not the indexes. Based on history, if we do get a FTD in the next few days, it is unlikely the market will take-off and resume the previous uptrend, if for no other reason than we have a fair bit of overhead resistance from regretful buyers over the last three months who are praying for the chance to get out at breakeven. So while this pullback is constructive in the big picture, leave the raging-bull hat in the closet for the time being. As for headlines, it seems like we are stuck in the movie Ground Hog Day as we continue seeing the same economic stories recycled from last year. We should start calling it the “olds” because there is nothing new about it. As it stands everything should already be priced in the market fairly well given we just reset for the Q1 Teflon rally that was completely oblivious to ominous headlines. Not to say we can’t dip a bit lower over the coming weeks and months through the market’s typical gyrations and head fakes, but it will take something genuinely new and unexpected to crash the market from here. Maybe this is Greece actually getting kicked out of the Euro instead of just idle speculation and debate. Or some kind of irrefutable proof that China has been manipulating their economic numbers and the situation is far more dire than we are lead to believe. But as long as we are simply fretting over a sluggish economy or a Greek default, that is already baked into the cake and accounted for. In individual stocks, FFIV is getting crushed today and is 20% off of its 52-week high. This is just one of many recent examples of why every great investor preaches never fall in love with a stock. Date them and then take your money and run while the sun is still shining. The idea of home-run hitting is extremely seductive, who doesn’t want to hold a great stock through an entire 1,000% run? But while it is easy to identify the biggest winners at the end of each year, the thing we fail to consider is the hundreds of stocks that had the exact same fundamentals and chart patterns that crashed and burned. This phenomena is called survivor bias because we only study the successful and ignore similar examples that plunged into obscurity. In trading, the best way to hedge against this is to take your 20% profits and move on to the next hot trade. 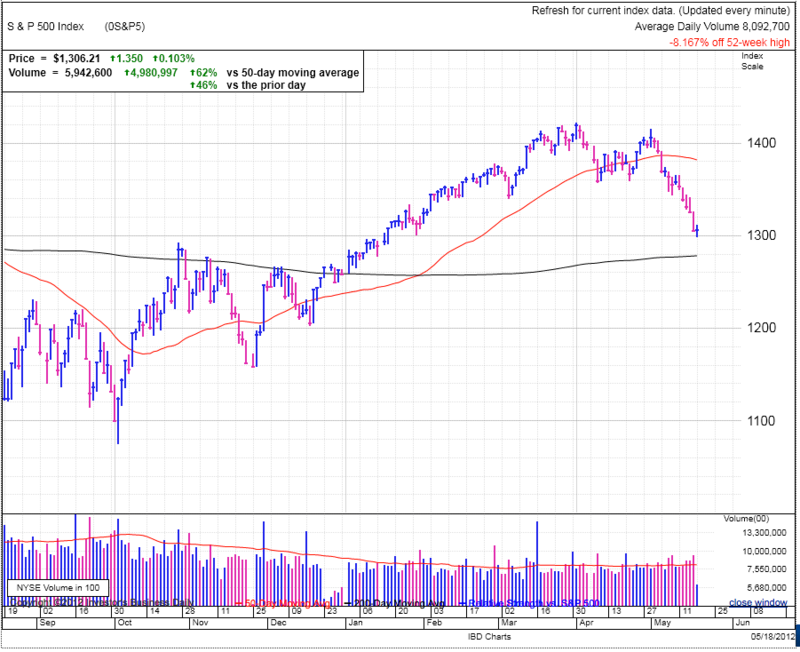 The markets are facing another bout of weakness after a strong showing on Monday and early Tuesday. 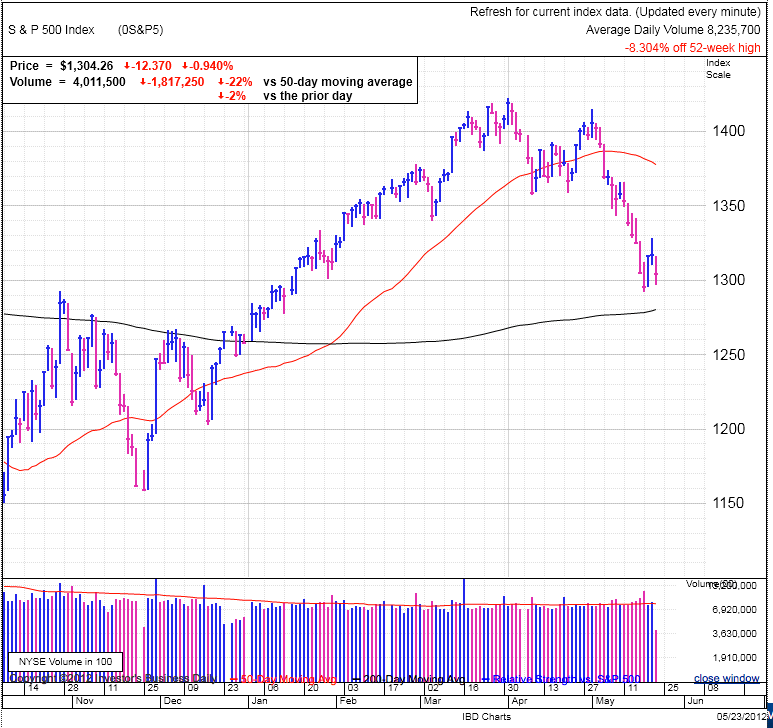 Almost all of those gains have been wiped out as the S&P500 is flirting with 1300 again over renewed Greek concerns. But so far we continue holding above Friday’s low, keeping the rally attempt alive. If we honor Friday’s low, starting tomorrow we could have a follow through day if there are nice price gains on higher volume. While there are a lot of similarities between this year’s sell-off and last year, the big difference is this market don’t seem nearly as frantic. Last year could easily be described as bi-polar as the market whipped from one extreme to the other, but this time around things seem far more orderly, lacking those violent changes in sentiment. 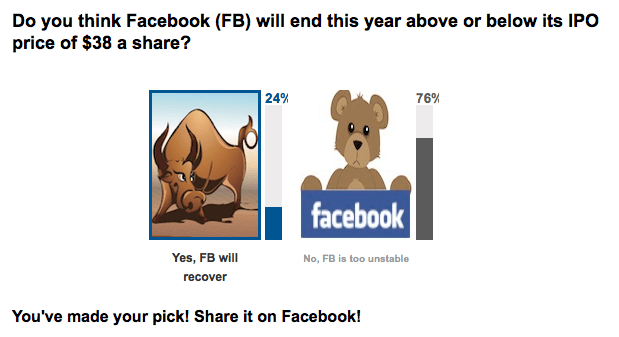 If last year was bi-polar, the current market is simply indecisive. Similar Euro and economic headlines are weighing on the market’s mind, but the market is no longer fearing the end of global civilization and is doing a better job of keeping headline risks in perspective. These unresolved issues will continue to haunt us for a while, but the market is acting far more rational and that is giving the market more stability. Even if the indecision continues through summer, I expect we’ve already seen the bulk of the sell-off. We’ll probably dip under the 200dma or 1257 to go flat for the year at some point, but that will most likely be the process of building a solid foundation for this correction to bounce off of and that violation of support will not be a trapdoor triggering a massive sell-off. Of course this assumes a fairly orderly resolution to the Euro debt problem and modest economic growth. No doubt the markets will unravel if the Euro comes apart, China crashes, or conflict in the Middle East threatens oil supplies. But barring those unlikely events, the market should be fairly stable going forward. Of course there is a big difference between stable and rallying. It will take a period of price consolidation to find suitable resolutions to these headline issues and that will delay the indexes from making new highs for a bit. 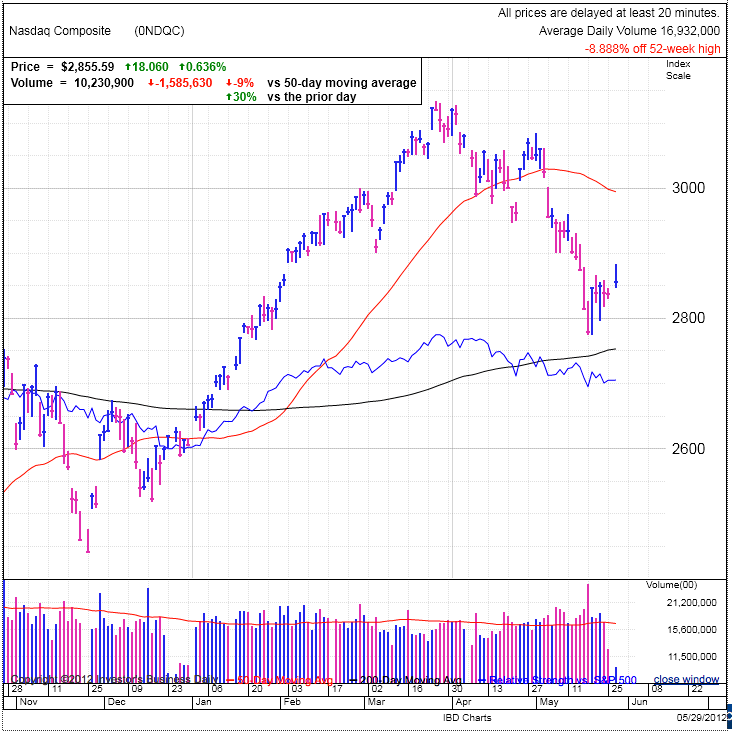 But while the market might trade sideways, there will be opportunities to locate leading stocks making big price gains once the market headwinds stop knocking them down. Not a lot to say about individual leading stocks right now as most of the favorites continue trading under their 50dma. But standard bases take at least two months to form, so we shouldn’t be expecting many of these CAN SLIM stocks to start making new highs any time soon. Patience is the name of the game and we just have to wait for the market and individual stocks to move back into buyable positions. If we were being optimistic, we should hope for a tradable fall rally to help end the year on a strong note. If someone has problems sitting on their hands for the next couple months, you’d probably do better buying the dips and selling the rallies. In a sideways market, buying breakouts can be a frustrating and expensive game. No doubt there will be a handful of strong performers, but these will be the exception, not the rule. So be very selective and disciplined with any buys for a while. And of course I reserve the right to be 100% wrong and revise my opinions as the conditions warrant. 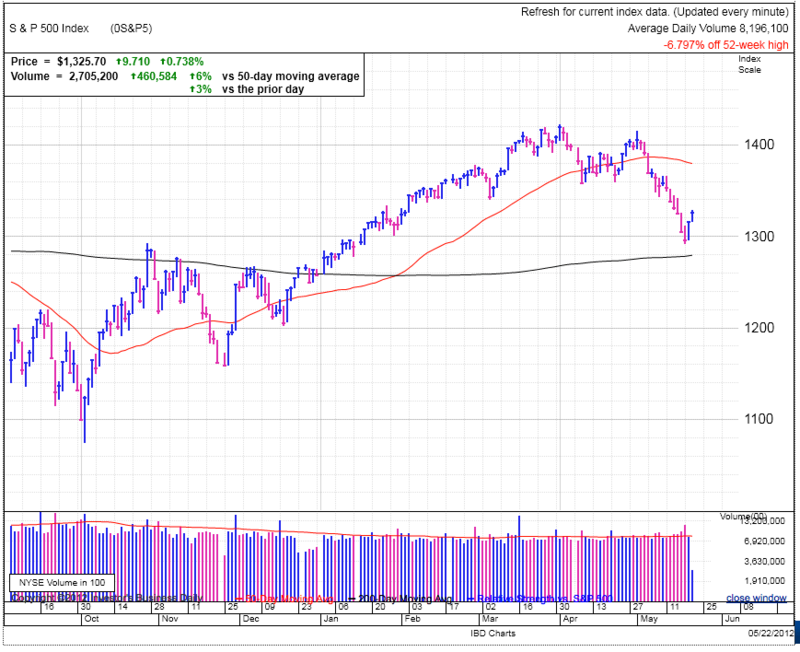 The markets opened flat, but rallied out of the gate in continuation of yesterday’s strength. While yesterday’s price gains were impressive, the lack of volume demonstrated a reluctance of people to jump on the bandwagon. Of course this is not a red flag by itself since most traders are late when recognizing a a reversal. Part of the reason I’m suspicious of this most recent rally attempt is I would feel better if it undercut a major technical level in order to flush-out a large number of holders on huge volume before bouncing higher. Potentially 1300 could be that obscene level the markets often trade to before reversing, but it just doesn’t feel like the dip under 1300 triggered that huge, emotion driven sell-off. No doubt Friday’s volume was high, but given it coincided with options expiration, the volume was fairly mediocre when compared with previous options expirations. The other thing is the sell-off hasn’t been drawn-out enough for traders to grow numb to headlines the way they did last fall before kicking-off our most recent Q1 rally. Traders continue to be fairly sensitive to headlines and any bad news could trigger a new wave of selling, hampering a sustained rally. Plus I don’t think the sell-off has reached obscene valuations due to irrational selling that provide such a compelling value that stocks can bottom and rally in the face of dire headlines. But a lot of what we should expect depends on what direction the market is headed. There are three general market directions; up, down, and sideways. And based upon where we are headed will determine what kind of price action we should anticipate. Much of the above expectations of a huge volume undercut is based on forming a bottom and resuming the previous uptrend. 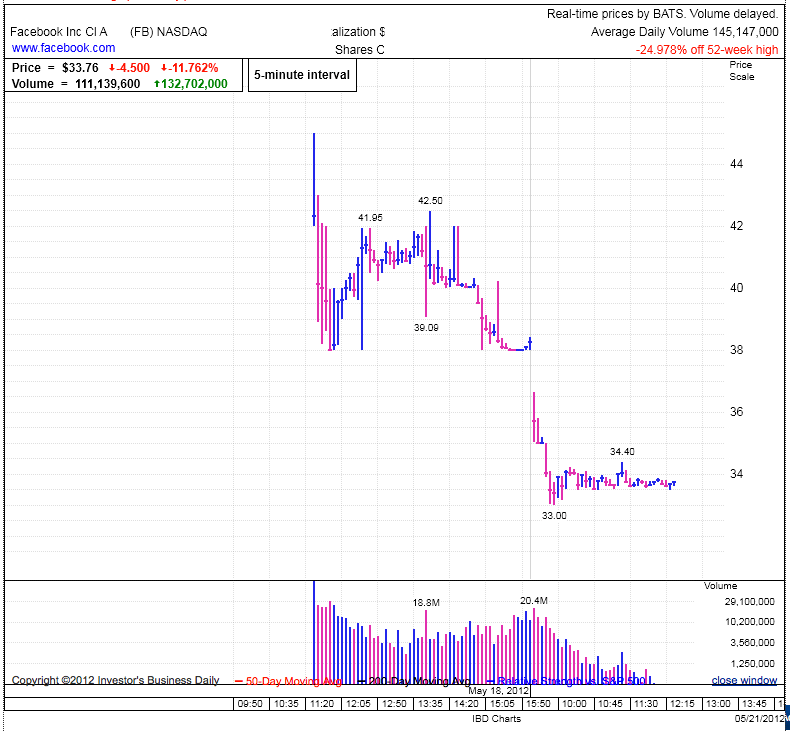 This shakeout of weak holders is what clears the way for a move higher. But if we don’t get that flush-out, the bottom is less solid and will more likely lead to a sideways range until time and repeated pullbacks demoralize and humiliate weak holders, thus setting the stage for a continuation of the previous rally. And finally we could be experiencing a temporary bounce on our way much lower. But given how far we have come already, a large portion of the correction has already occurred and barring a huge shock to the system, I expect we are fairly close to this move’s lowest point. Given the headlines, economy, and forward looking nature of the market, it is not surprising the market got ahead of itself with the Q1 rally and needed a rest. Of the above scenarios, I expect trading range is where we are headed until the market can sort through some of these headline risks and then ultimately finish the year with a nice rally. Now, I don’t expect last Thursday was the bottom of the trading rang and the one of the follow-on dips will likely test the 200dma or 1257 area before bouncing. For an example of how this might look, refer back to last summer’s trading range. I don’t anticipate the same volatility we saw back then, but the we could trade sideways in a similar fashion through this summer. If we are transitioning into a trading range, the best way to trade this is to buy the dips and sell the rallies, capturing profits early and often before the market has a chance to take those back. It could be months before we switch into rally mode where you can hold stocks for extended periods of time. Of course trading sideways does allow some of the strongest stocks to sustain a rally, but these will be the exception, not the rule, so plan on capturing profits on most of your trades and avoid taking round-trips on your trades. But these are just my opinions and I could easily be wrong, so we need to follow and trade what the market gives us. In the markets, it is okay to be wrong, but it is suicidal to stay wrong. Poor FB was again getting destroyed this morning, down 7% in early trade. Even more interesting given how difficult it is to locate shares for shorting, meaning most all of the selling pressure is coming former FB bulls dumping shares by the truckload. This could be setting up an interesting buying opportunity if the selling becomes too overdone. And even as I write this, the shares have rebounded and are only down 2% by late morning. Given the volatility, I would only view this as a trading opportunity because I remain skeptical of FB’s future growth opportunities since they already have 1/2 of the planet’s internet users. I have little doubt subscriber growth is will decelerate and to plateau as they reach the saturation point and growth tapers to population growth and global internet adoption rates. But regardless, the stock presents a great trading opportunity for the nimble given the high volatility in the name. 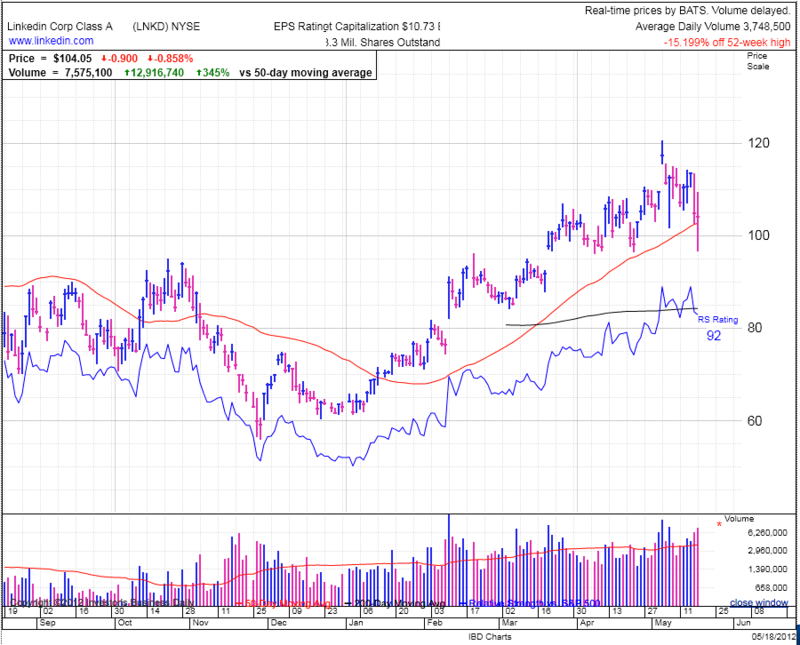 LNKD is recovering nicely from the FB induced sell-off as investors are recognizing the difference in growth and revenue potential between the two companies. In addition, some of the liquidation pressure on LNDK in order to make room for FB in investor’s portfolios has relented and this relief has allowed LNKD to bounce back. 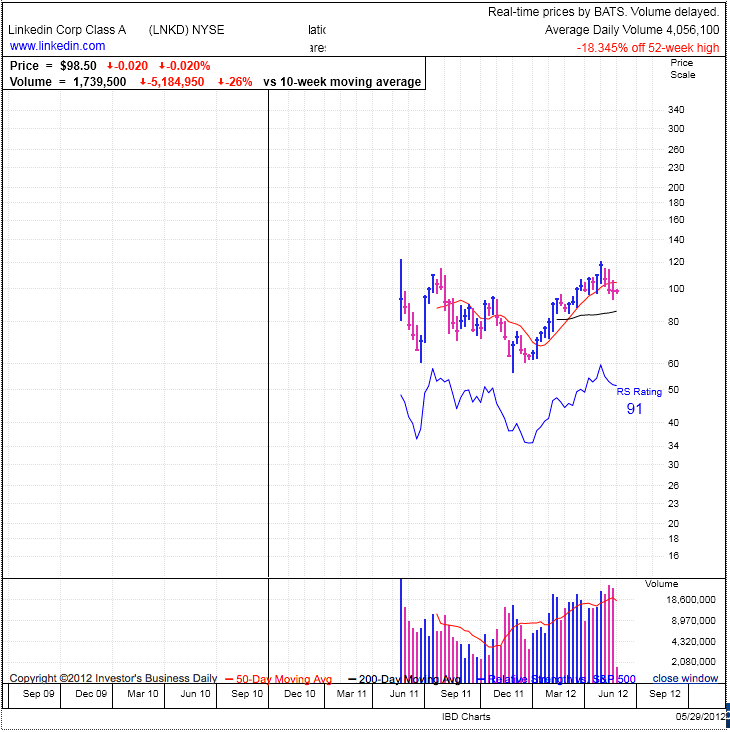 It was a nerve wracking ride, but LNKD has recovered its 50dma. But that is the volatility home-run hitters should expect when trying to hold high-beta stocks through a correction. I don’t have those kind of nerves and why I prefer selling on the way up even if it means giving up some upside potential. The indexes rose nicely in early trade, a welcome sight given the streak of six consecutive down-days and 11 losses in last 13 trading sessions. Is this finally the bounce everyone has been talking about, or the inevitable up-day that is part of most larger sell-offs? And lets not forget many of the previous down-days were up early too. Of course the difference today is the markets are up far more than those more modest rallies that quickly fizzled. Either way, I think buying today’s bounce still counts as catching a falling knife and is best avoided by any prudent trader. One day does not make a trend. The news driving today’s rally is word from European leaders they want to keep Greece in the Euro. Glad to hear that Euro problem is finally solved and we can move on. (sarcasm) If I were a wagering man, which all stock traders are, I would say a sizable portion of today’s rally is driven by short-covering. By itself short-covering is unsustainable without real buyers stepping in to support the new move. From here we need to wait and see if a meaningful number value buyers are ready to venture back in. On Friday the S&P500 closed under 1300, while not an important technical level, it is a key psychological mile-marker and no doubt got people’s attention. 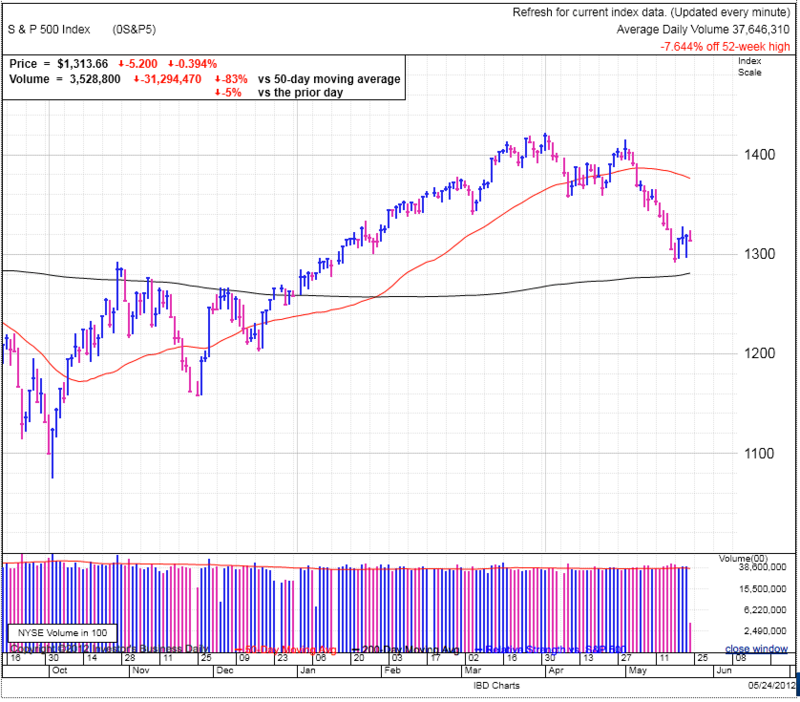 The 200dma is the next major target at ~1280 and also coincides with some technical levels dating back to last fall. 1257 is another major psychological milestone on the horizon since it represents giving back 100% of the Q1 rally. Will we bounce off of this region? Break through it and then bounce? Or will it simply be a speed bump on the way to lower prices? Sentiment in the market is getting precarious and any further declines creates the very real risk of triggering a irrational, fear based sell-off. People have been able to rationalize most of the recent decline as normal pull-back and and part of a healthy refresh of the phenomenal Q1 rally. But what was supposed to be a 3-5% correction is quickly becoming uncomfortable. Regret is mounting, as is the fear of greater regret by allowing additional losses to pile up. 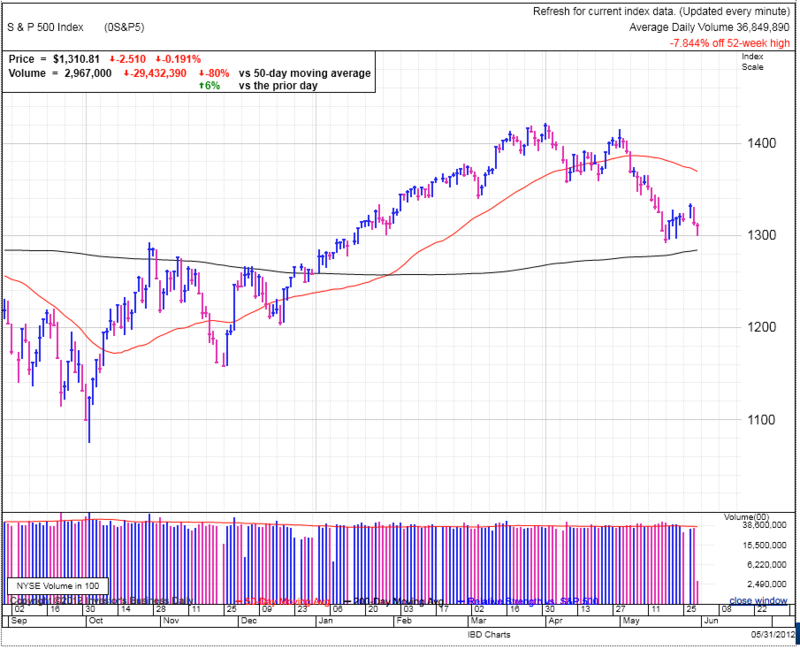 No doubt today is a relief rally for those still holding, but to have the market turn back around and make new lows will push many traders to the point of selling simply to make the pain of stop. And of course that whoosh-down will be the capitulation point that often signals market bottoms. Part of the reason I suspect we haven’t seen a mad rush for the exits yet is the powerful Q1 rally has left many people sitting with winning trades even in the face of the recent sell-off. As any of us know, it is one thing to see profits dwindle, yet an entirely different feeling to watch your account go into the red. Maybe this lack of significant panic selling is because many traders are still up for the year and this is acting as a stabilizing factor keeping the markets more rational during this correction. 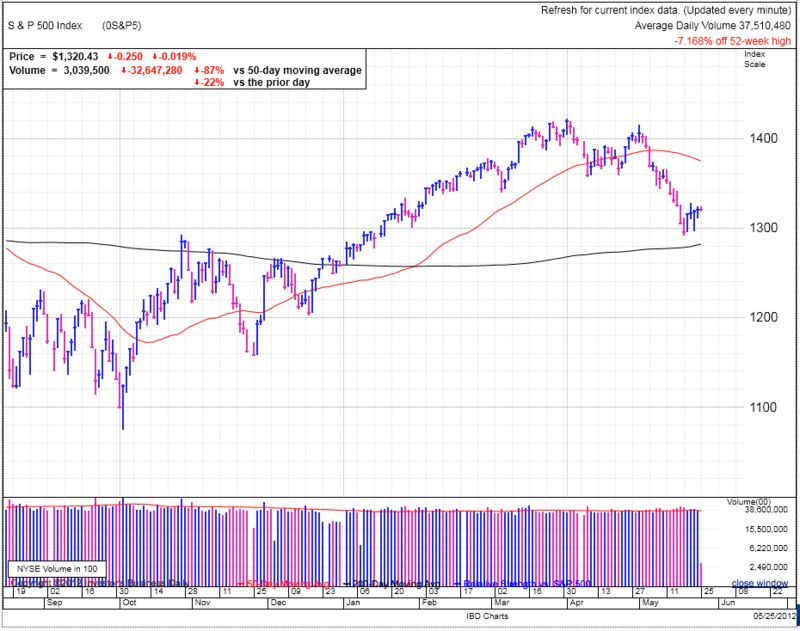 But it is something to be aware of if we continue to fall and that pushes more traders into the red for the year. FB is providing a lesson in market sentiment and supply and demand as the most assured IPO pop in history is plunging 12% instead. And no doubt FB could have crashed on Friday had the underwriters not dumped a ton of into the name in order to avoid a an ugly first day sell-off. Yet again the market proves that the best move is to trade opposite of what everyone else thinks. Of course this doesn’t mean the stock is dead and it could easily rally after forming an IPO base. And so this brings us back to the indexes again. How many people are saying the market is set up for a great short vs how many say the sell-off is overdone and ready to bounce? There are no numbers to gauge this in real-time so we need to go with our gut based on the clues around us. Now this is simply my opinion, but it seems like not enough people have been demoralized yet to justify a turnaround from this aggressive sell-off, leaving me highly suspicious of today’s rally. No doubt today’s strength could continue for a couple days, but that is how a sawtooth decline looks. But regardless of bear or bull outlook, the disciplined CAN SLIM trader is waiting for a follow though day to avoid falling prey to a sucker’s rally. And when we do get that follow through day, we need to be ready to start buying the market. Often the more reluctant you are to buy the follow through day, the more likely it is to work. Markets moved lower in early trade, continuing recent weakness. The question remains how much longer can this continue? One thing to remember is the current price is a balance between bulls and bears. Moves occur when a slight imbalance occurs between bulls and bears due to new information or changes in sentiment. The result is prices adjust to relocate that precise point where exactly half the money is on each side of a trade. So while you have an opinion one way or the other, 50% of the market has the opposite view and this disagreement is what makes markets work. The challenge for a successful trader is figuring out which side to pick. The interesting thing to ponder is if this sell-off has become too obvious as we clearly broke support? Most often profits go to those who get on a trade early and those showing up late are stuck with the bill. Keeping this in mind, can we continue assuming the upward bias and overbought condition remains in the face of these horrible technicals? Using an analogy, it seems the market is on thin-ice. Apprehension has been building as prices decline and renewed fear of headlines is haunting traders. But the thing about thin-ice is you only get in trouble if it breaks. The market could easily skate past this thin patch unscathed and come out the other side ready to rally. If this is the case, we might see the market begin bottoming soon. But the danger with thin-ice is we are one bad headline away from a plunge where everyone panics at the same time. Last summer we found ourselves in a similar position with lots of storm clouds on the horizon leaving investors fidgety. Then the one headline hit that sent everyone running, S&P downgrading US debt. The downgrade was telegraphed for months and the actual result of the downgrade turned out trivial as the Treasury market rallied in the face of the downgrade. But once the selling started in the equity market, it quickly spiraled into a two-week free-fall as the S&P500 lost 17%. The market was in the mood to sell-off and it found its excuse. Could this market be setting up for the same thing right now? The silver-lining to our current sell-off is it has been fairly orderly and so nothing like the fall-off-the-cliff we experienced last summer. Further, traders who saw the world did not come to an end due to Euro contagion last fall will feel a sense of been-there-done-that and won’t be as panicky this time around. All of this is a long way of saying, I think we are one bad headline away from a material sell-off, but baring that, the market could find support soon. But if the latter case plays out, the rebound won’t signal an all-clear as any rally still has significant technical and sentiment resistance to breakthrough before moving to new highs. As for how to trade this, the short is a bit long in the tooth as it has become fairly obvious and the market doesn’t like being obvious. Anyone putting on new short now is a late to the party unless their game plan is entirely based on a waiting for that backbreaking trigger to send the market tumbling. But when comparing the risk/reward, the short continues to be the more attractive trade because on the long side you are currently risking ~$3 of downside to make ~$1 of upside. With that skew, the best play continues to be waiting. 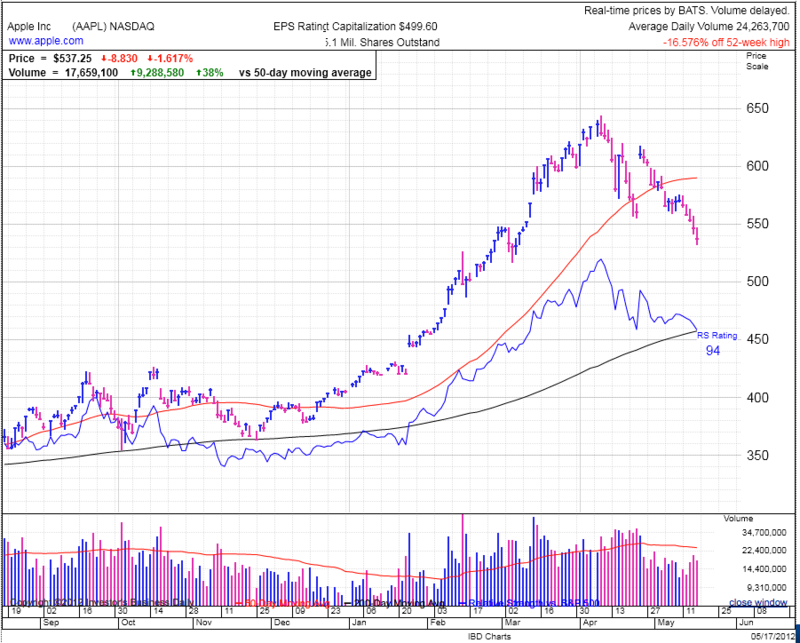 AAPL is dragging down the NASDAQ and its relative strength line is breaking under recent lows as it continues its trend of under performance after its awe inspiring rally last quarter. There doesn’t seem to be much technical support because the previous rally was nearly straight up without much consolidation. This could be hindering the stock from arresting its slide. And much like the gold trade, sometimes overbought/oversold sentiment overrules fundamentals. By all measures, AAPL continues to be a great company, but the trade appears too crowded and it will take some time to rebalanced sentiment before it can resume its move higher. LULU is selling off aggressively as it is breaking support at the $70 level. 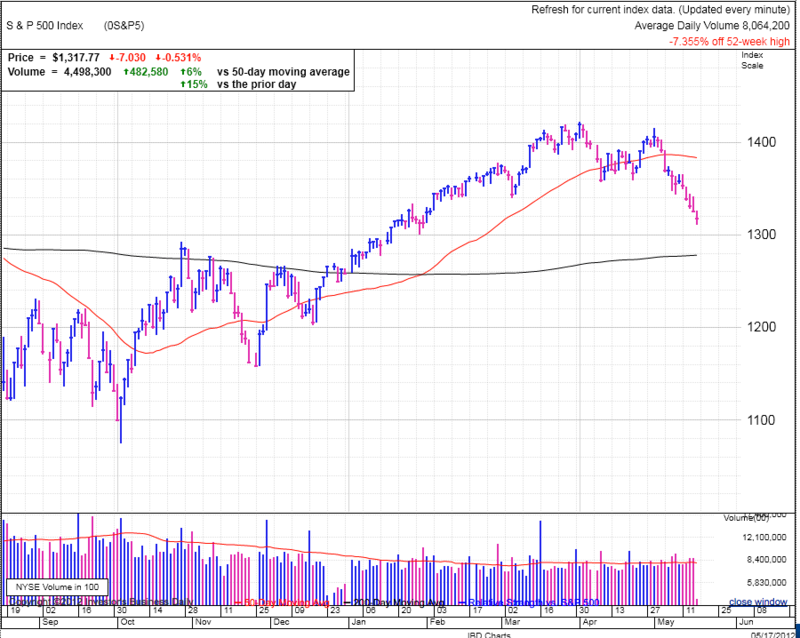 LNKD is also dropping 5%, but it is still remains above its 50dma. These are reminders no matter how strong a stocks, very few can make progress in the face of a weak market, and high beta stocks feel the pressure more than most.